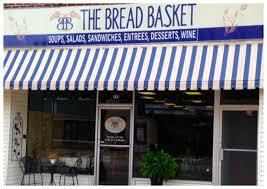 The Bread Basket serves homemade soups, salads, sandwiches, hot entrees and desserts. Reservations are accepted and walk-ins are always welcome. Carry-outs are also available through our pick-up window. Browse our great selection of scarves, jewelry, purses, Blue Mountain greeting cards, Tycoga & John Ernest Vineyard Wines, flavored coffees, and many other unique gift ideas and decor. Available for private parties and catering. Open Tuesday through Friday, 8:00 a.m. to 3:00 p.m.